I first heard Martin Hinckley speak at an AACC forum. That talk was published in Clinical Chemistry, 1997;43:873-879. A new article is available at http://www.springerlink.com/content/y5m227582854220k/fulltext.pdf (I suspect this link will work for a limited time). This article deals with automation and how it has not lived up to the expectation that it would greatly improve quality. Hinckley offers some interesting advice regarding how to improve the implementation of automation. A previous essay described FMEA and FRACAS. 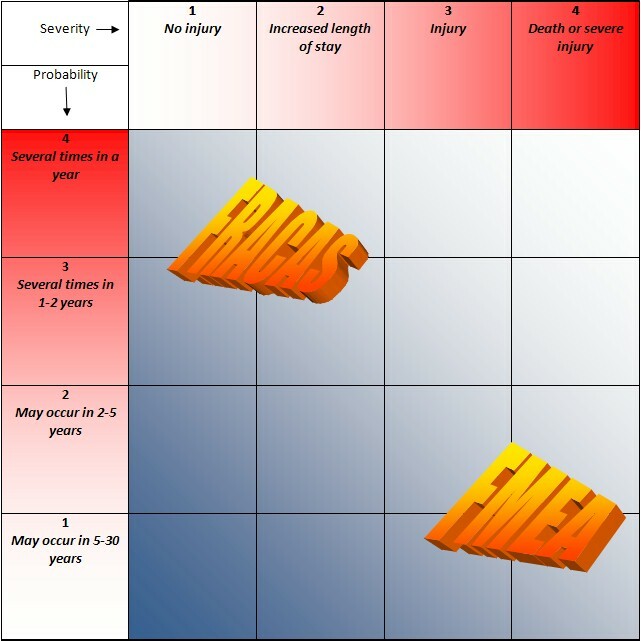 The following figure, modeled after the VA HFMEA severity and probability grid, shows the relationship among these terms. Legend – The degree of blue color indicates the quantity for each cell. Thus, the 4×4 cell is largely empty whereas the 1×1 cell has the highest quantity of failure events. This figure can be used to describe either FMEA or FRACAS events, where to recall, FMEA signifies potential events and FRACAS signifies observed events. For example, an event such as wrong site surgery is a FMEA event, because for most hospitals, this is a potential event and has not been observed. It is an event with a severe effect so one must question whether sufficient control measures are in place to continue to prevent this event from occurring. All potential events have causes and causes are also events. This is where a fault tree is valuable. One can establish causes for a connected series of events and view as a graph (there are no graphs in a FMEA), causes connected to a higher level patient harm event. The lower level events – the causes – often are observed events and these are the FRACAS events. One wishes to ensure that in spite of the occurrence of these causes, no patient harm event will occur because there are sufficient control measures to terminate the connected series of events. In a fault tree which enumerates all error events, there will be other observed events which don’t lead to patient harm. The purpose of a Pareto analysis is to distinguish the criticality among causes so that resources can be concentrated on causes connected to patient harm. Although this may seem obvious, in the real world, one is faced with the tradeoff of providing corrective actions for many cost related FRACAS events vs. those connected with patient safety but extremely rare. You are currently browsing the Krouwer Consulting blog archives for March, 2007.